At Dean Street Dental our dentists are on hand to clean teeth and gums by removing calculus, stains and plaque to enhance a healthy, brighter smile. To keep a healthy mouth, patients are shown by the dentist how to maintain good daily oral hygiene care for their teeth and gums, including how to select the correct toothbrush best for their mouth, and the use of flossing and interdental brushes to prevent gum disease or bleeding gums. A scale and polish involves the removal of plaque, calculus and staining from the tooth surface using an ultrasonic scaler followed by polishing using fluoridated prophylaxis paste, to assist in maintaining healthy gums and improve the appearance of stained teeth. Periodontics is the speciality of dentistry dealing with the gums and underlying bone which support and hold our teeth firmly in place. Gum disease can be prevented with good oral hygiene and regular visits to our practice. 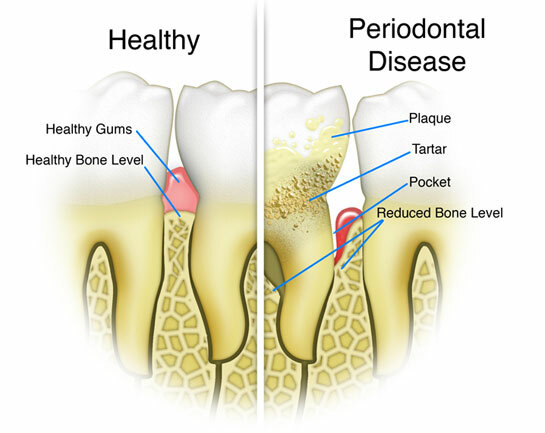 Periodontal (gum) disease (which is the loss of bone under the gums that holds our teeth in place in our mouths) is very prevalent in adults, but as there are very few symptoms, many people are unaware of its existence until it is firmly advanced. Signs to look for may include bleeding, sore, swollen or receding gums, bad breath, or sensitive teeth and/ or mobile teeth. Any of these can be signs of gum disease which if caught early can be reversed, or if more advanced the disease can be stabilised, and then bone regeneration techniques may be possible to restore lost bone. Smoking is a main cause of gum disease and our dentists will endeavour to help and offer advice with smoking cessation to stabilise the patient’s mouth. Once gum disease is established, different treatments are carried out by our dentists to deliver the best outcome for the patient’s needs with careful scaling and polishing to restore good gum health. We offer flexible working hours with late appointments available. Emergencies are treated as they arise (or arrive) to accommodate patients in urgent need of treatment. © Dean Street Dental 2018. All rights reserved.